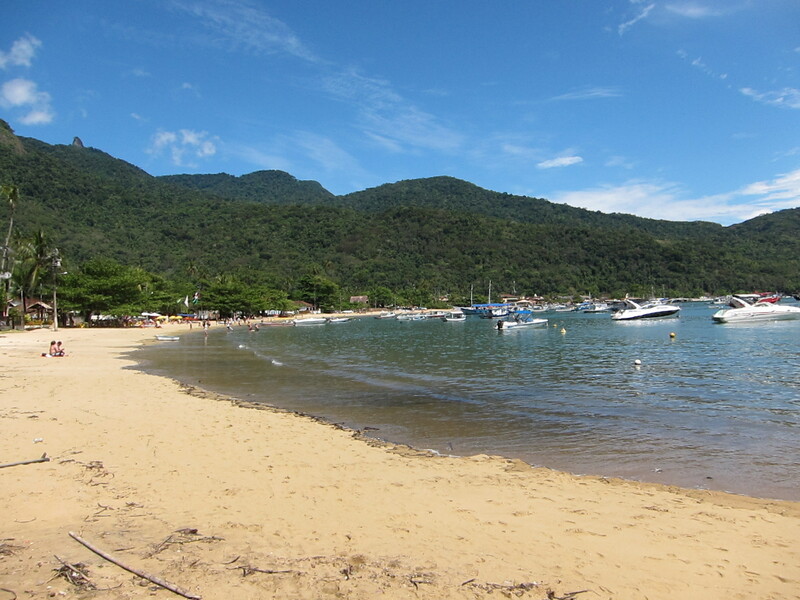 I had planned to stay in Rio for the last five days after I returned from Ilha Grande however my friend Greg asked if I’d like to go with him to Buzios, a small beach town a couple of hours north of Rio. 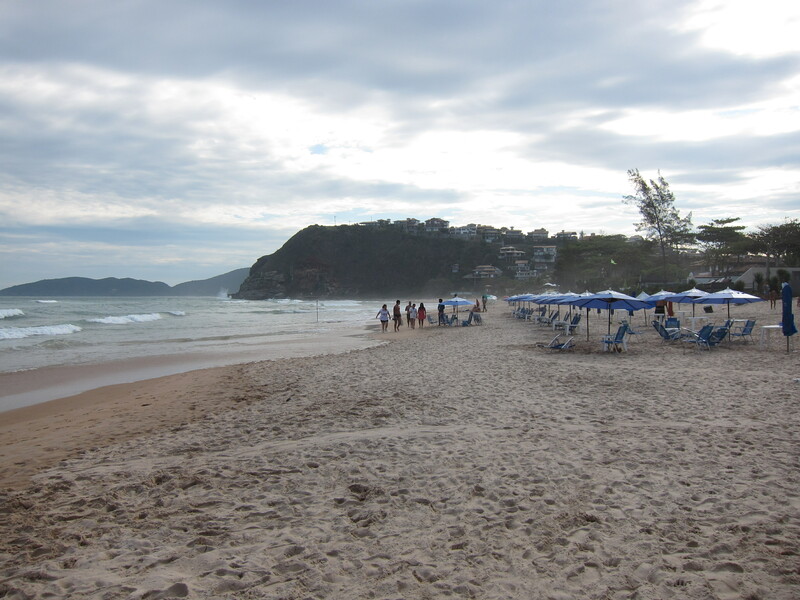 I thought it sounded great so we headed off on Friday morning with the plan of staying two nights and then heading back to Rio. It was an absolutely gorgeous town and you could see why so many Brazilians go there for weekends away and summer holidays. It wasn’t a big place and was mainly made up of accommodation places, restaurants, shops and bars. Pretty much all the things I like in a town! 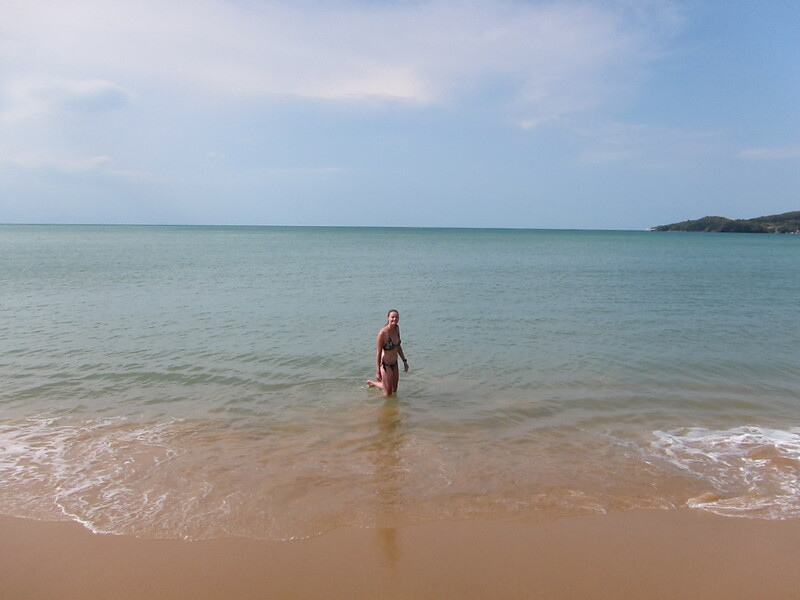 When we arrived we headed down to the small beach right next to the town and went for a dip. That night we headed out to one of the great restaurants in the main part of town. There were so many great places to choose from but we ended up going to a fantastic place owned by a Frenchman, so Greg felt right at home. We had the local specialty which was a huge seafood soup and it was delicious! 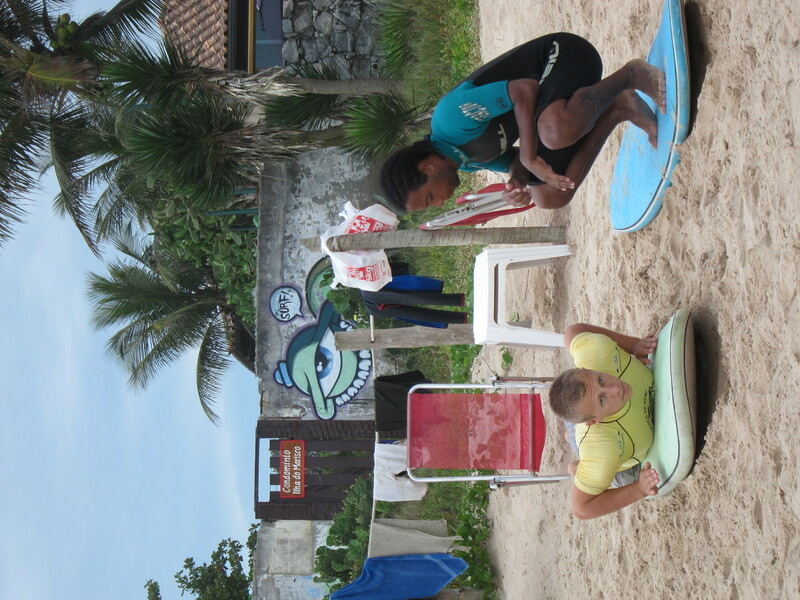 As we were leaving we noticed a place that offered surf lessons, which Greg was really keen on doing, so we decided that we’d come back the next day and stay another night in town. The next day we hit the beach again, Greg in his surf shirt, and me on my deckchair, under my umbrella. While Greg did a few practice runs, I grabbed an acai (a local berry drink) and sat back ready to watch. And the boy didn’t do too bad! 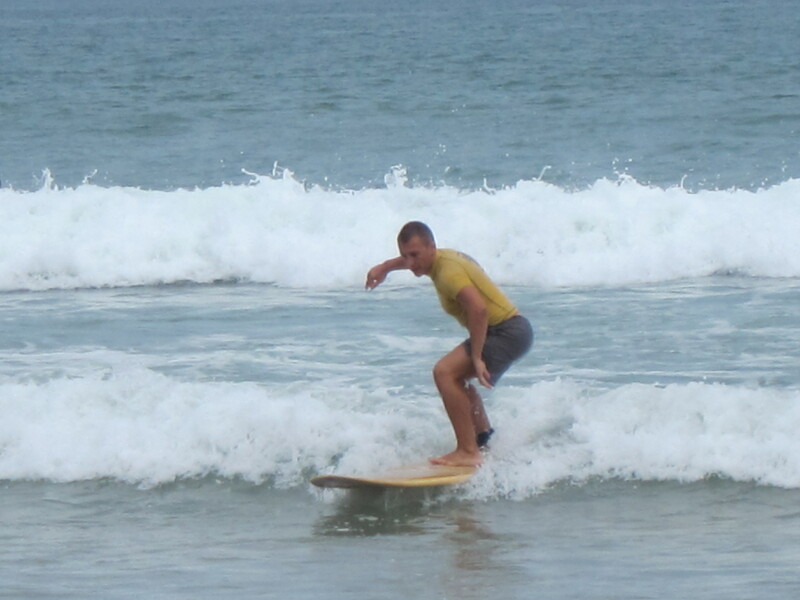 He was up on the board looking like a pro on a number of occasions. After a quick break and some more energy food (more roasted cheese on a stick) he was back out there and carving it up. I took on the role of official photographer, but after a while I had to head back to my umbrella, I was starting to feel the burn. 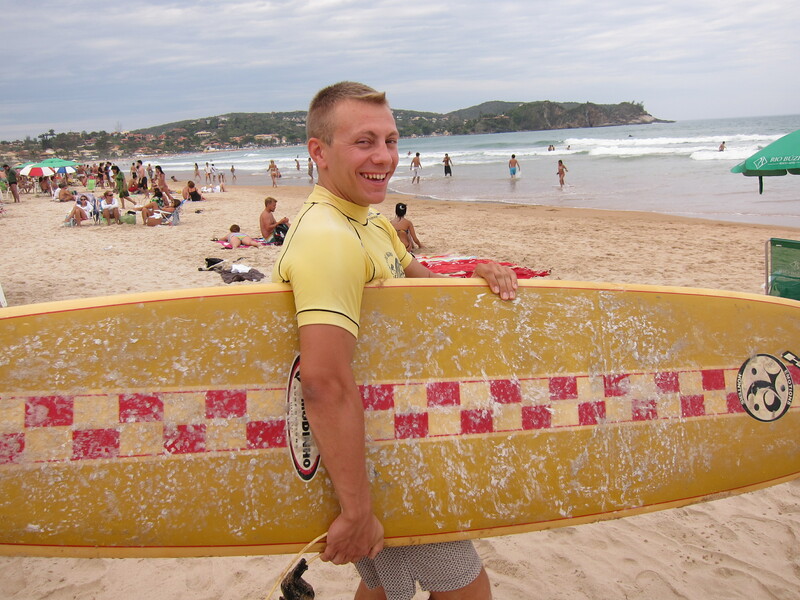 After a while he felt he had sufficiently conquered the waves so he came back in and we headed back to town. A successful day for Greg and quite a relaxing one for me. 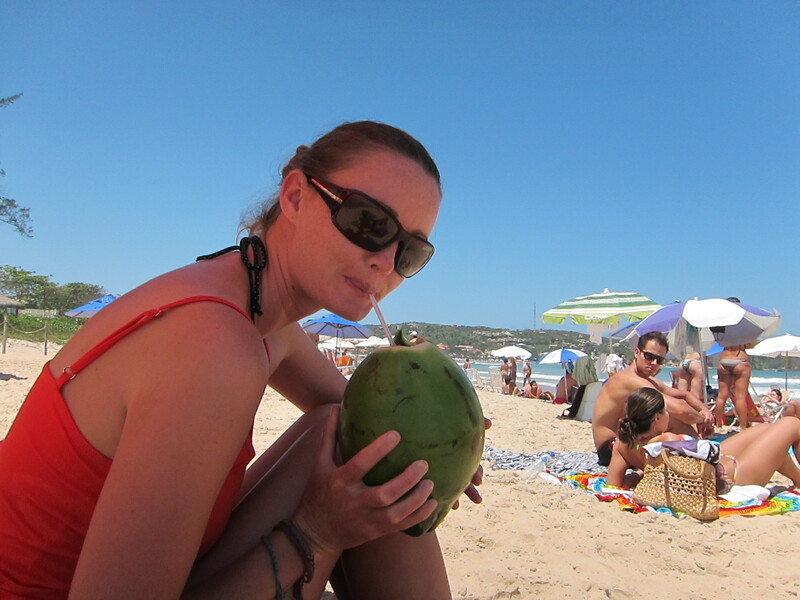 The following day it was back to Rio after a couple of beautiful days in Buzios. 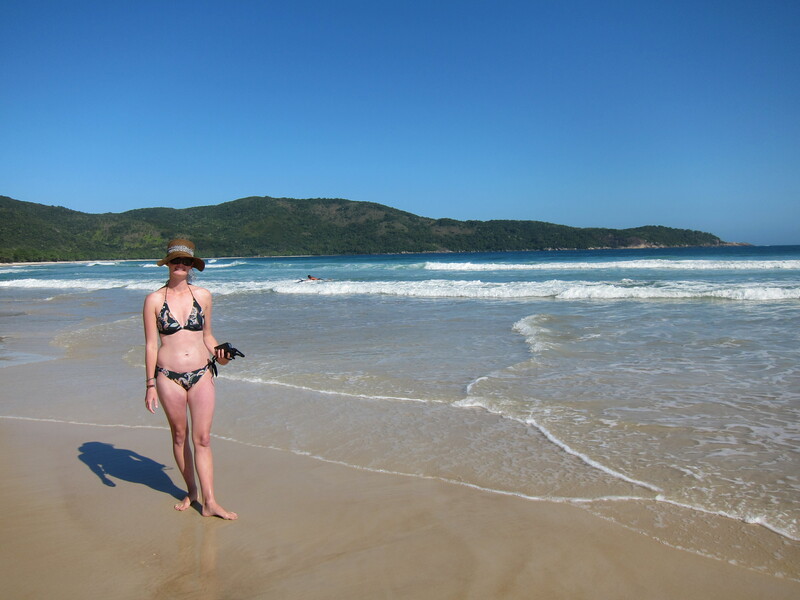 It was such a gorgeous place , so peaceful with spectacular beaches and fabulous food. I think it would be crazy-busy during Summer though so I’m glad we were able to go when it was a little calmer. Thanks Greg for the invitation! 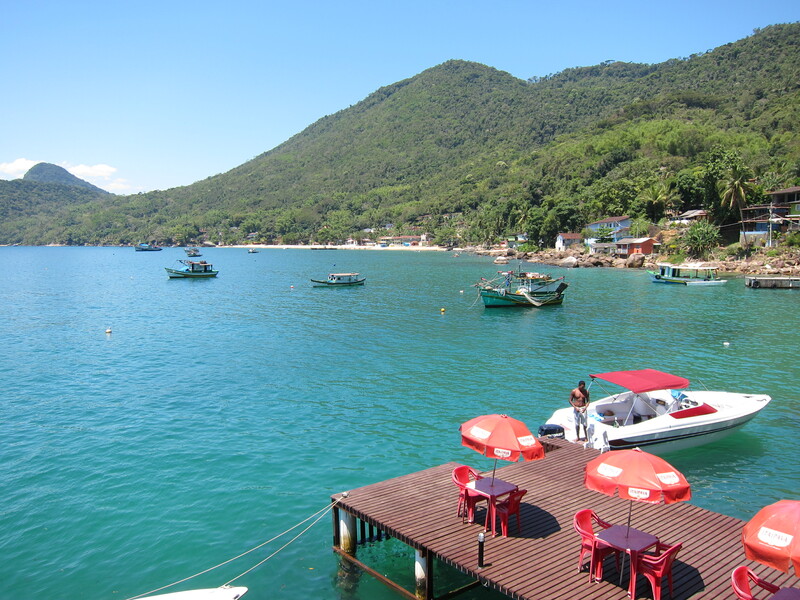 Ilha Grande is a beautiful island a few hours south of Rio. After a rough and wet journey over on the boat I arrived at the Che Lagarto hostel that overlooked the main beach on the island. When I arrived it was a bit cloudy but the weather forecast said that it was going to be sunny for the next few days, and luckily it was spot on! 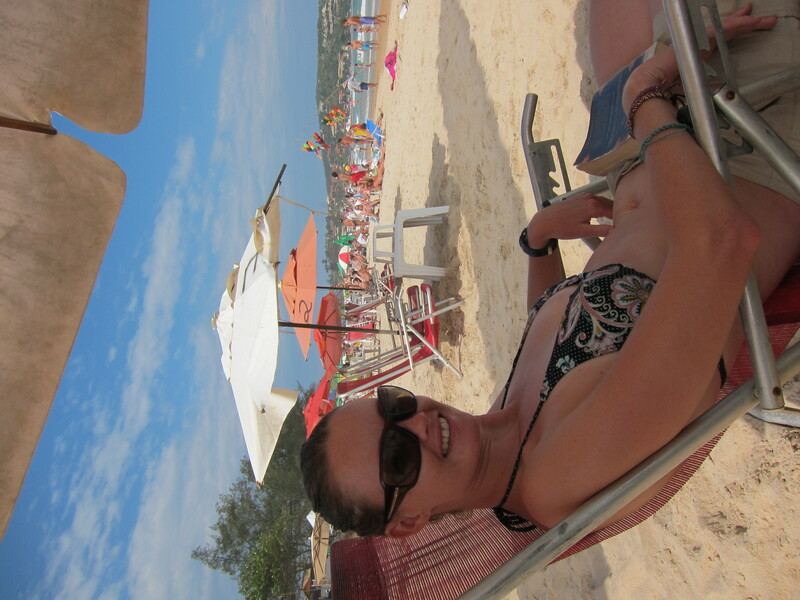 The next day I wandered around the island and stopped at the next beach and spent the day relaxing and reading on the beach. After lunch I hit up the self serve ice cream store where you can choose however many flavours you like and they charge you by weight. That night a big group of us went into town to have dinner and on the way back we came across a group of people drinking around a fire on the beach. After grabbing some supplies from the hostel we joined them and a couple of the guys commandeered the guitar and serenaded us all. The stars were absolutely amazing and although I proved to be hopeless at spotting shooting stars it was almost surreal to be sitting on the beach of a beautiful island in Brazil around a fire and gazing up at a perfect sky. Definitely a night to remember. The next day we caught a boat over to the surf beach called Lopez Mendez. 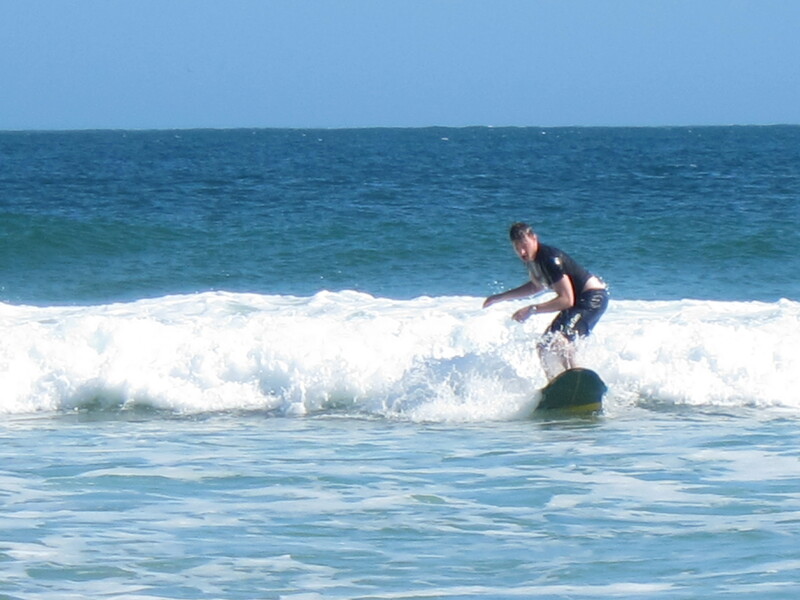 It was an absolutely gorgeous day to be sitting on a beach, watching the boys try to surf , and taking the occasional dip to cool down. That night we went to a BBQ at a nearby restaurant where you could choose between different skewers of meats, cheese or a couple of varieties of fish. While it took almost two hours for our food to arrive, and we had drunk quite a few caipirinhas by that time, the food was absolutely delicious! Capped of by the fact that once again we were located on a gorgeous beach under the stars on a perfectly warm evening. I was meant to leave the next day however I decided to stay on one more night because the weather was absolutely perfect, there were some great people staying in the hostel, and there were still so many beautiful places to explore on the island. 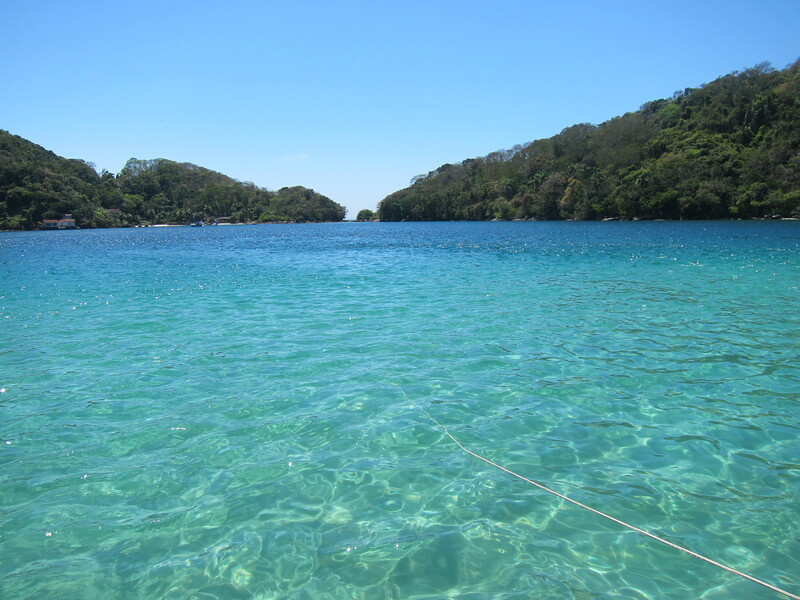 A small group of us decided to go on a boat tour around the island that visited six beaches and a couple of lagoons where you could snorkel. We were picked up in an awesome speed boat and spent the day taking in the beautiful sights of the island and swimming in some absolutely gorgeous beaches and lagoons. Although, one of the best parts was the speed boat ride in between the stops because it was quite choppy out on the open water making the trip a bit like a roller coaster ride. Another amazing day! 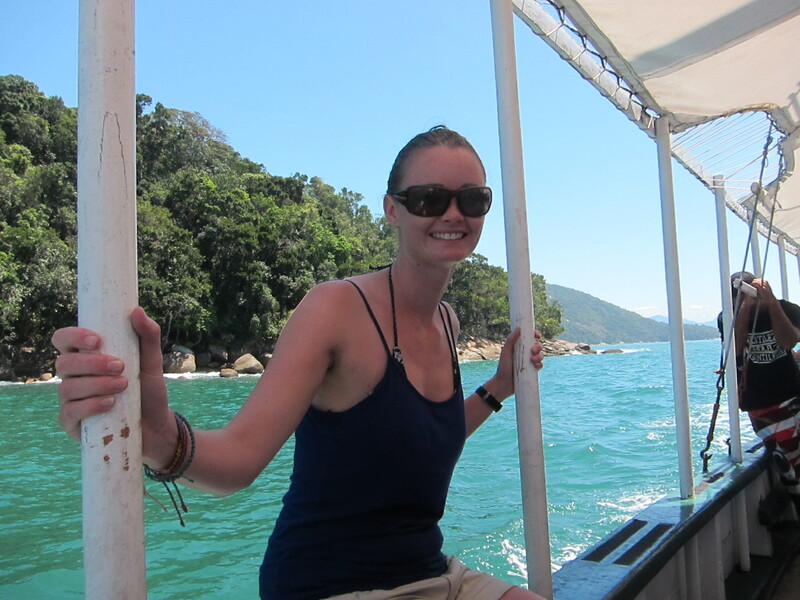 The next morning I took the boat back to the mainland and a bus trip back to Rio. 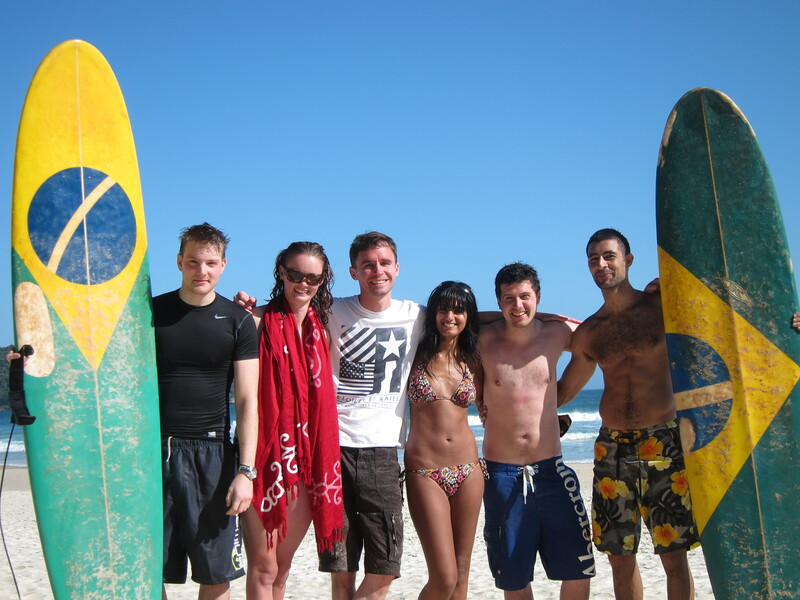 It had been an amazing few days with perfect weather, beautiful beaches, delicious food and amazing people. 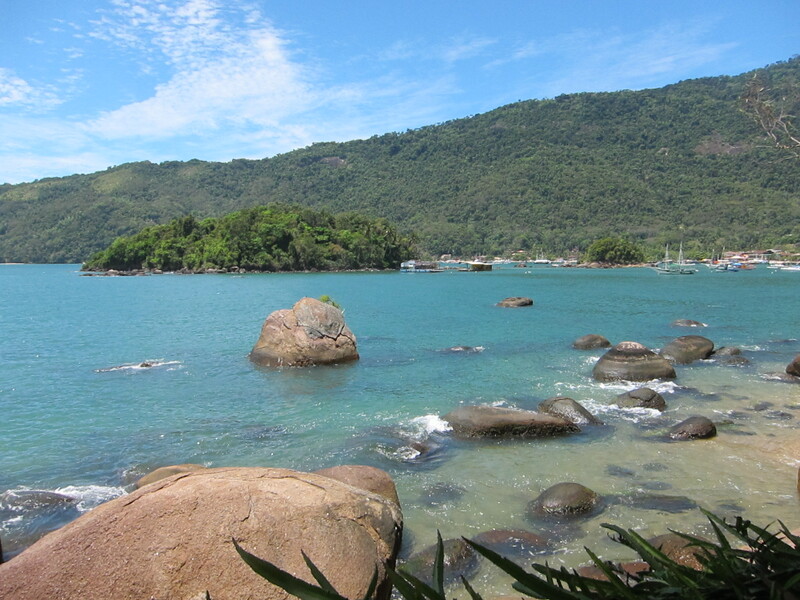 If you go to Brazil definitely visit Ilha Grande, it’s the perfect place for a romantic getaway but is also lots of fun if you’re by yourself or with a group of friends. It can be as relaxing or as action packed as you like. 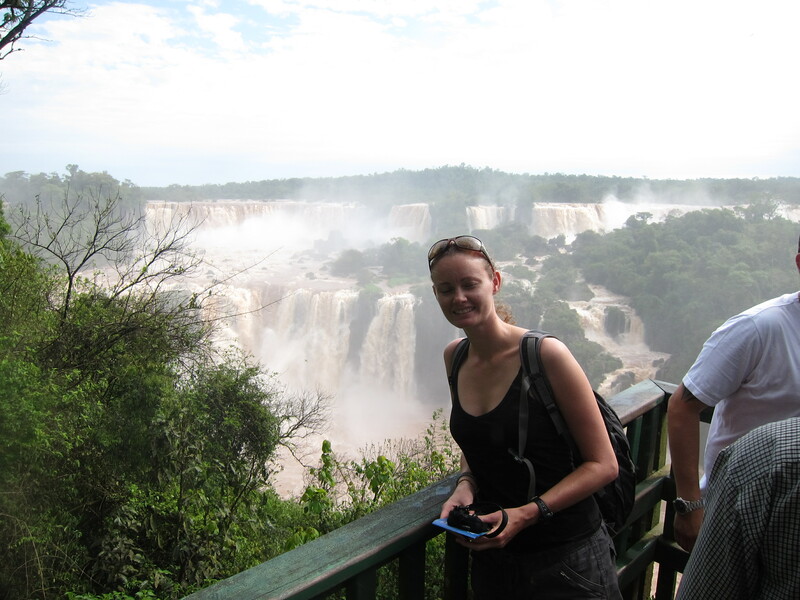 After another lengthy bus ride (17 hours) I arrived in Puerto Iguazu, the town close by to Iguazu falls which is located on the border of Argentina, Brazil and Paraguay. 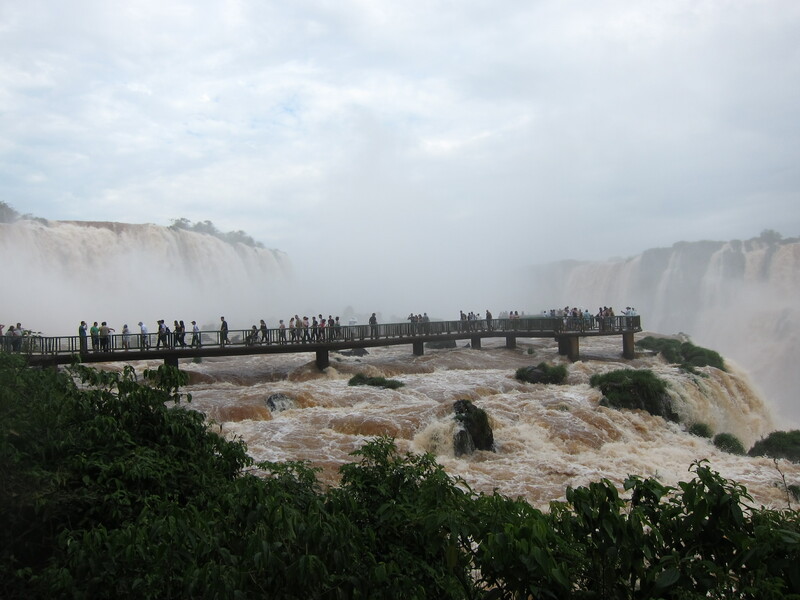 After arriving around lunch time I headed straight over to the Brazilian side of the falls where you are able to get the grand view of the falls. I was completely blown away by the phenomenal amount of water going over the falls and just how many falls there were stretched over several kilometers. It was absolutely spectacular! 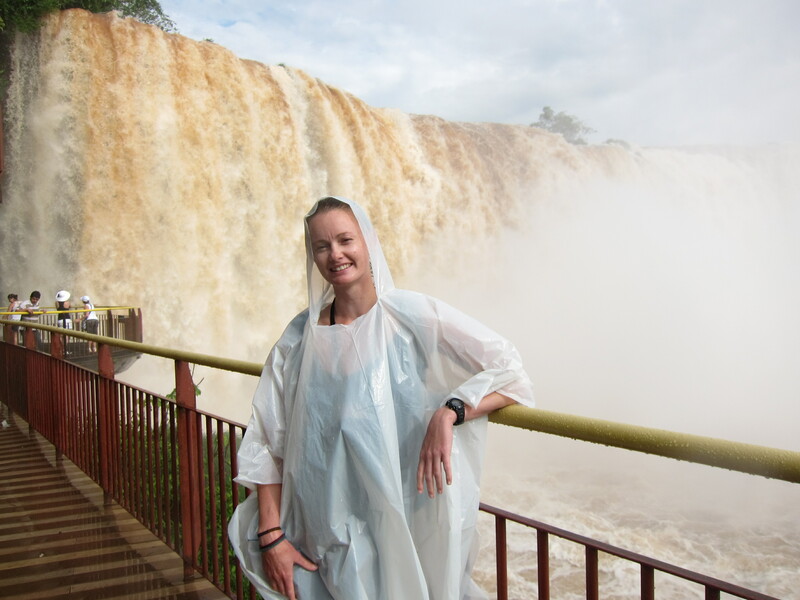 At one point I was able to walk out on a platform in front of a huge waterfall that was sending up such an incredible amount of spray that I got absolutely saturated. It was such an odd experience because for some reason I felt so happy and I actually started laughing out loud despite being myself and getting ridiculously wet. It seemed that it affected everyone in a similar way because everyone I saw had a huge smile on their face. Apparently it might have something to do with the negative ions in the air but whatever it was it was an incredible experience. 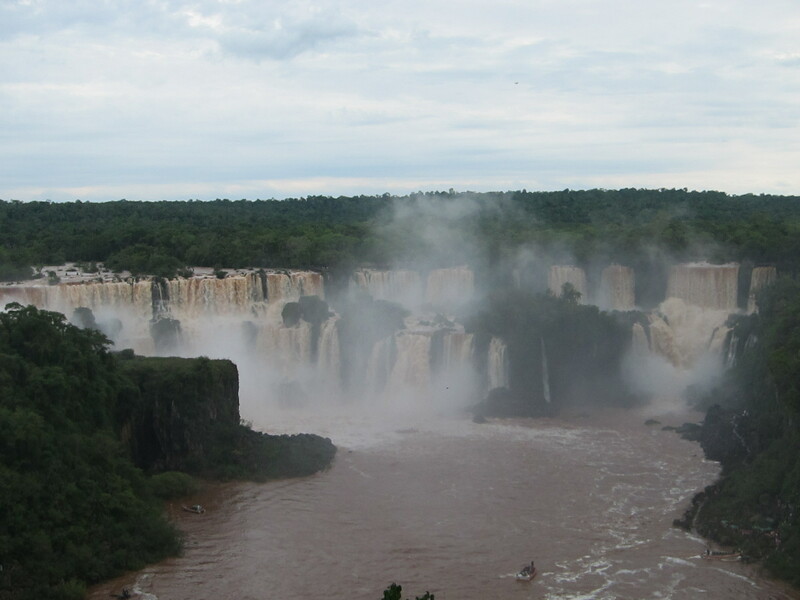 The next day I headed to the Argentinian side where you are able to get more up close to the falls. Once again it was amazing to see just how much water there was going over the falls. 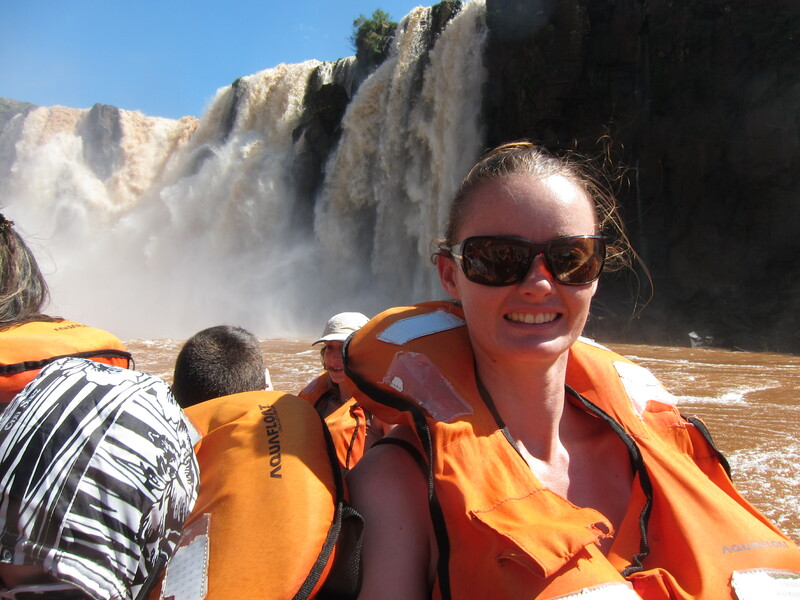 I also took a boat ride that goes down underneath one of the falls and you get absolutely soaked. It was amazing to feel just how powerful the water is. 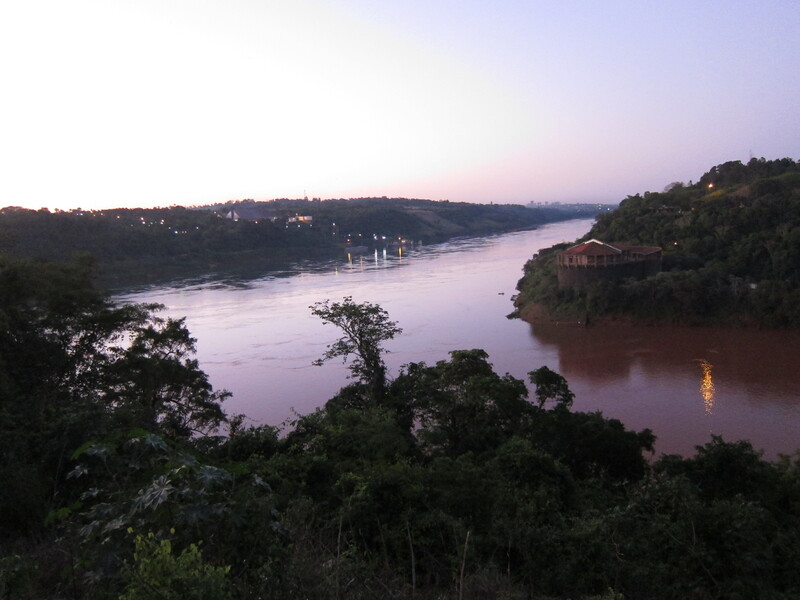 That night a group of us headed to a spot in Puerto Iguazu where you can see Brazil and Paraguay while standing in Argentina. Pretty cool! 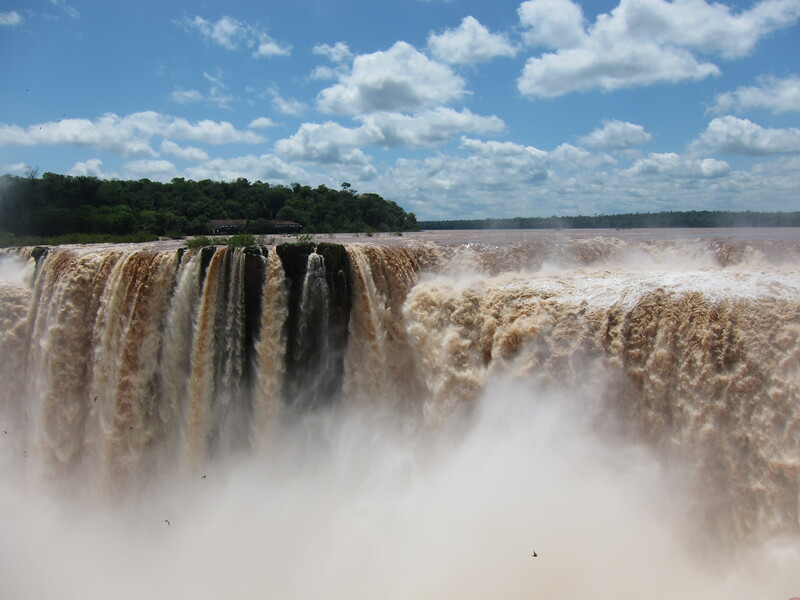 Paraguay on the left, Brazil on the right and Argentina at the front. 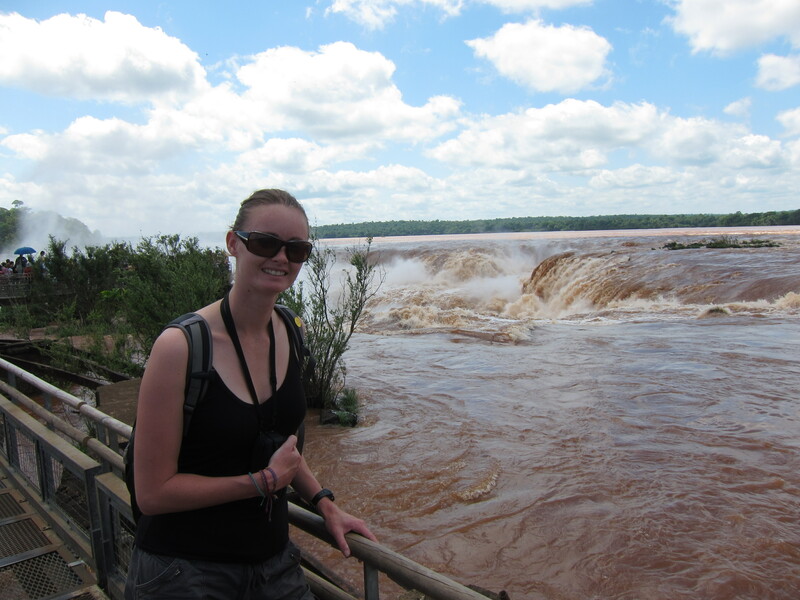 Puerto Iguazu was a really nice town and while I was there the weather was absolutely perfect – sunny and hot. The falls are one of those things that I would definitely recommend to anyone traveling in South America, apparently they put Niagra Falls to shame! Three months seems like a long time, but in a place like South America where there is so much to see and do, I think that three months will fly by. So I’ve decided that I’m not going to attempt seeing the entire continent but rather visit a few countries and do them justice. As I said in my last post, I am flying in to Lima, Peru on the 1st of August and I join my Gap Adventures tour the next day. The tour lasts 21 days and ends in La Paz in Bolivia. I am hoping that I will meet some lovely people on the tour who are continuing their travels through South America that I might be able to travel with. I’d like to stay a few days in La Paz, I’ve been told the people are very friendly and the markets are a must see. From there, I’d like to head south to see the salt flats in the south of Bolivia and then down through Chile to Santiago. I’m very keen to do a trip to Easter Island from Santiago but I want to try and find a good value tour to go on as it seems very expensive. From Santiago, I think I will travel further south (depending on how cold it is) to the Patagonian lakes district and then across the Andes to Bariloche in Argentina. Once in Argentina, I am planning to head to Mendoza, the wine area of Argentina and the home of delicious Malbec. I’ve never been a huge fan of red wine but after being persuaded by my friend Helina to try some, I have fallen in love and now I can’t wait to spend some time among the vineyards indulging in some of the finest vino Argentina has to offer. If Mendoza is the wine capital of Argentina then apparently Buenos Aires is the beef capital and anyone that knows me, knows that I love a good steak. So next on the list is the cosmopolitan city of BA. Buenos Aires is also the home of Tango and after doing one Tango class previously I cannot wait to learn more about this very steamy dance. 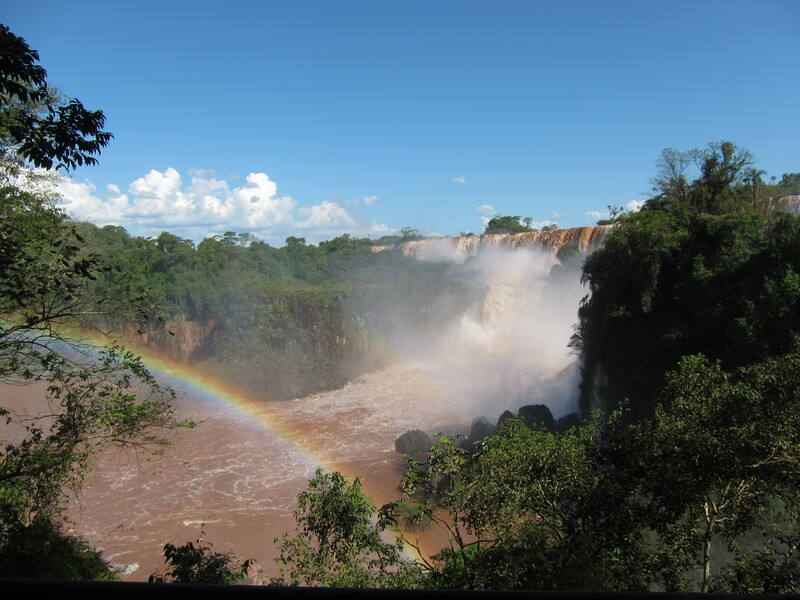 From Buenos Aires I want to head to the famous Iguazu Falls which sits on the border of Argentina, Paraguay and Brazil. 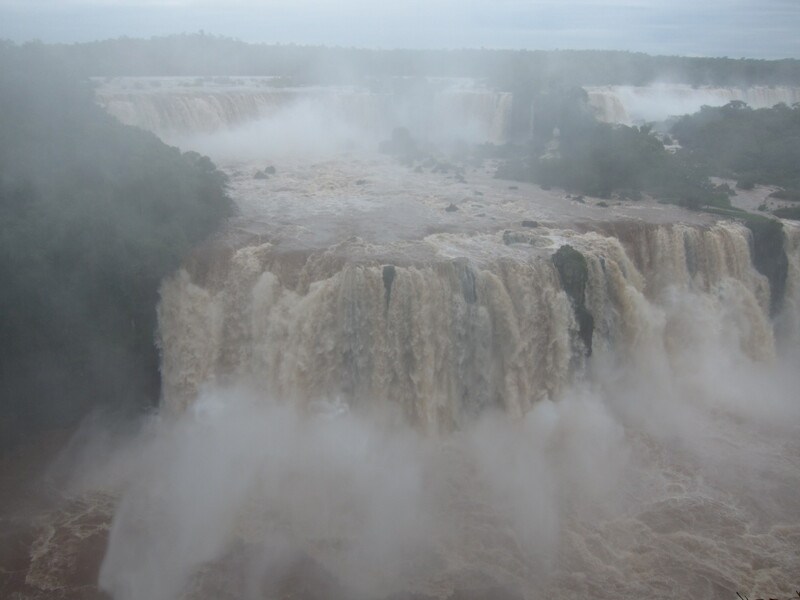 Iguazu Falls are meant to be some of the most spectacular waterfalls in the world and I’ve been told that you have to see them from the Argentinia side as well as the Brazilian side. 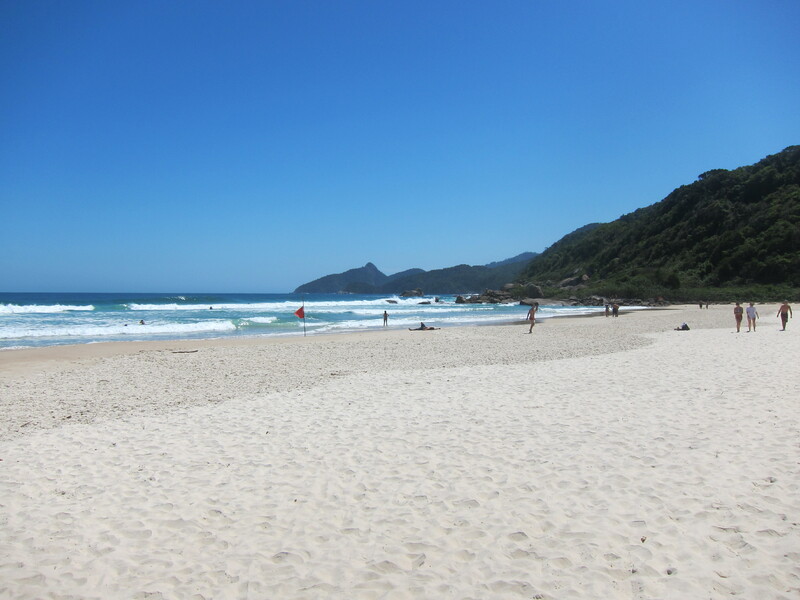 From there, I’m thinking that I might spend some time on the southern beaches of Brazil and hopefully soak up some sun, before heading north to Sao Paulo and then lastly to Rio De Janeiro which is where I will fly out from on the 1st November. Of course, this isn’t set in stone and there will be many other places visited in between. I’m very interested in hearing suggestions from anyone so please let me know if you think there is a place that I must visit. Well until next time, adios!